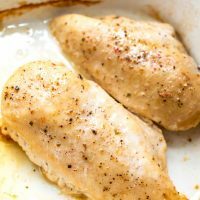 If you need to know how to bake chicken or are just wanting juicy chicken, this method for Oven Baked Chicken Breast is the way to go! This baked chicken recipe is fast, easy and perfect for your meal prep needs. Baking chicken breasts is a life saver when following the Whole30 or Paleo diets. My preferred method is Oven Baked Chicken Breast. I cook is fast and high to keep those juices inside. I have found this high heat method produces juicy chicken breast. The lower slower baked chicken seems to end up dry in my experience. So, it’s tastier and quicker . . . Win/Win! I began trying different techniques to cook chicken breast when I began doing Whole30 and Paleo recipes. Baked Chicken Breast is great for any eating style, but it is down right necessary for Whole30 and Paleo. That is why this is the first post for my Whole30 Month. Throughout June not only will I be completing a Whole30 cycle, I will be posting tons of Whole30 compliant recipes. 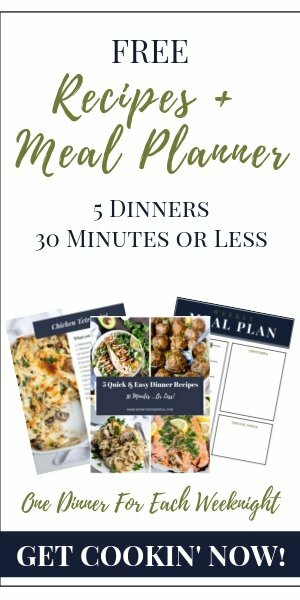 Don’t worry if you’re not doing W30, these recipes will be easy, nutritious and tasty for any occasion. How do you know when baked chicken is done? Everyone tells you your chicken is done when it reached 165ºF and that is perfectly acceptable. I personally take my chicken out of the oven when it reaches 160ºF because it continues to cook. 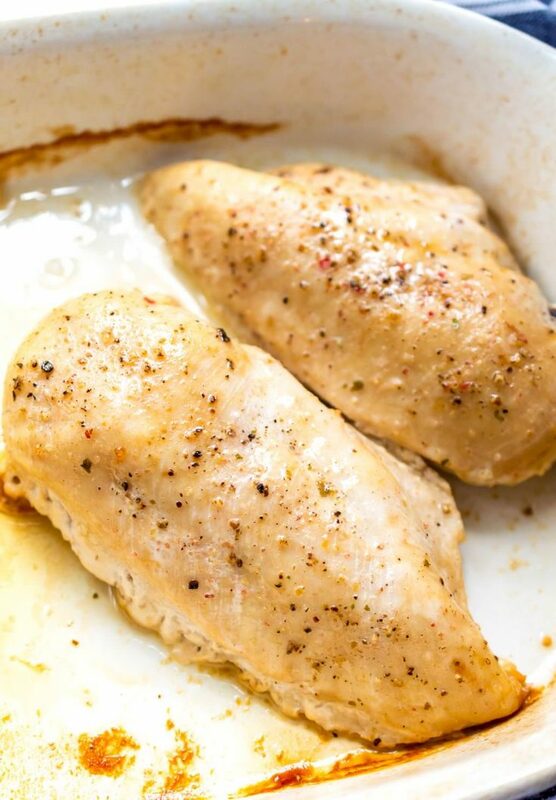 I find this method works for me and produces the juiciest baked chicken breast. How should you season baked chicken? I know salt and pepper seems so plain and boring. Buuuut, I am using the chicken in other recipes like chicken salad. So additional flavors will be added later on. If you want to add spices . . . go for it! Totally your choice. How should you use the baked chicken? I use baked chicken in all of my Chicken Salad Recipes. It is also great for salads, sandwiches, with veggies and for meal prep. You’ll need a good Baking Dish , Meat/Poultry Oven Thermometer . For meal prep, I use these Glass Meal Prep Containers with Lids . Quality, sharp knives are always good to have in your kitchen. I use these Chef’s Foundry Ceramic Knives and LOVE them! If your chicken breasts vary in size you will need to gently pound them until they are all similar thickness. This will ensure even cooking times. If your chicken thickness is a half inch or less, begin checking temperature after 10-15 minutes as it may cook faster. If using frozen chicken breast, allow the chicken to thaw completely before cooking. 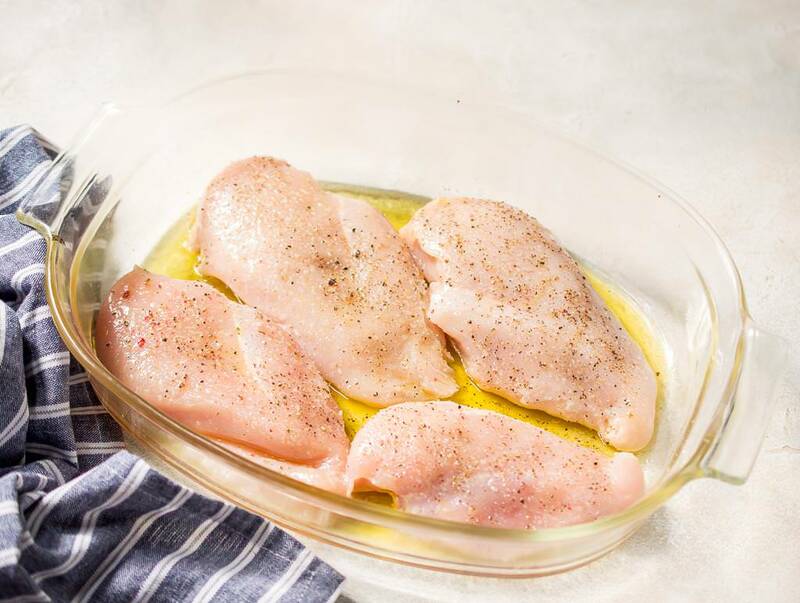 Coat chicken breasts with olive oil, salt and pepper then transfer to a oiled roasting dish. *Roast for 25-30 minutes or until 165ºF internal temperature. 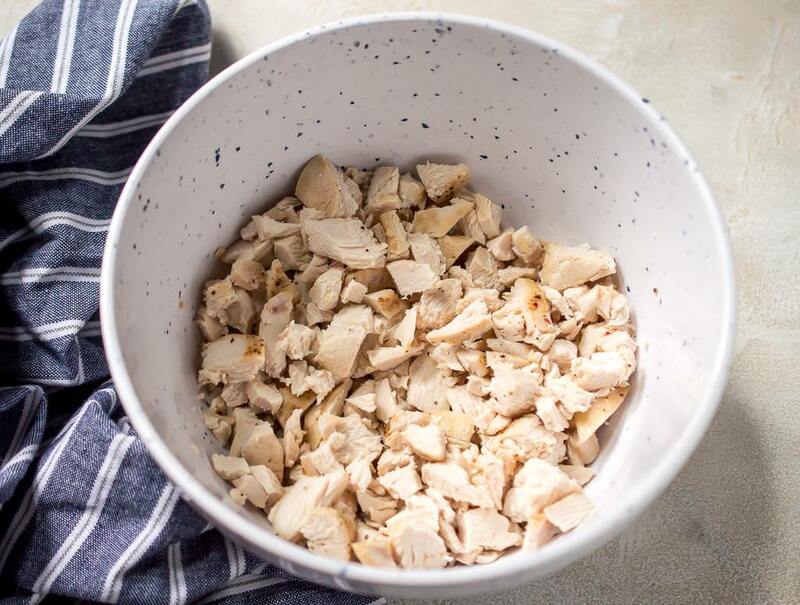 (time will vary depending on thickness of chicken) Let cool then chop or shred chicken. *If your chicken breasts vary in size you will need to gently pound them until they are all similar thickness. This will ensure even cooking times. 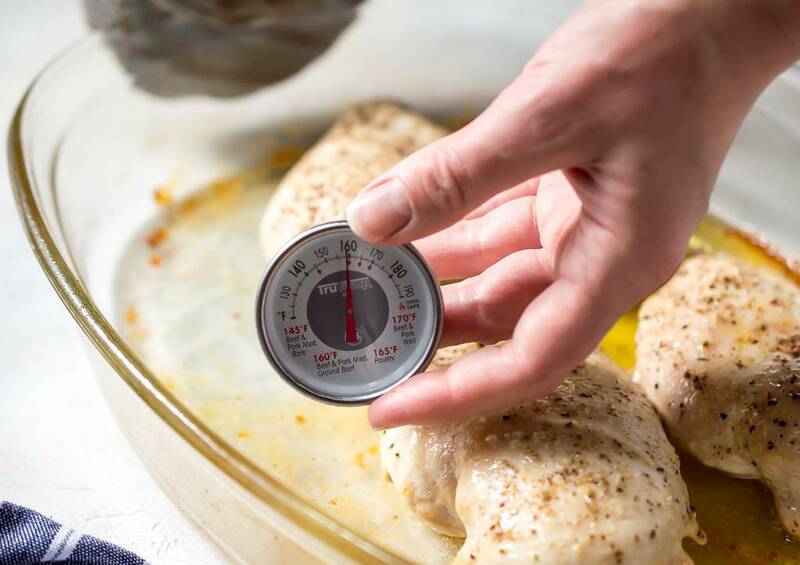 If your chicken thickness is a half inch or less, begin checking temperature after 10-15 minutes as it may cook faster. **All of my chicken salad recipes call for 1 Lb cooked chicken. So if meal prepping chicken salad you can double one chicken salad recipe or choose 2 different recipes with this amount of cooked chicken breast.